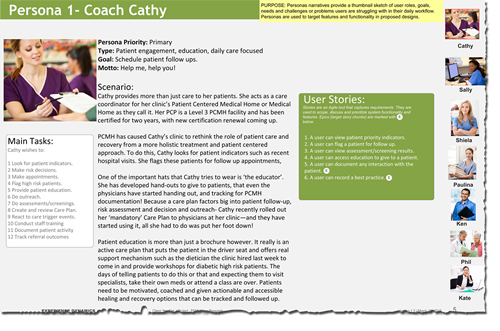 Can user research help understand the patient journey? With 26 million provider-to-health plan and provider-to-provider communication transactions completed on NaviNet monthly, NaviNet is the most broad-reaching healthcare communication network in the country. Changes to State and Federal healthcare direction meant opportunities to fix break-downs in the patient experience. NaviNet sought an objective view of what the Patient Centered Medical Home (PCMH) looked like, so they reached out to Experience Dynamics. NaviNet knew a field study was a powerful lens into the process and coping strategies of it's thousands of care providers. Before finalizing internal solutions and product requirements, NaviNet wanted to leverage the ethnographic benefits of watching users in their work environment. In collaboration with NaviNet's UX team, Experience Dynamics conducted office visits across multiple states. The doctor's office visits included physician, clinician and 'care coordinator' interviews and observation. By going out to the user environment we were able to 'thin slice' user workflow, culture and needs. Insights into how the 'medical home' (a new Federal certification standard for providing continuity of care) was dealing with change were breath-taking. User personas (behavioral profiles) helped capture roles, goals, tasks and dominant user needs, problem-solving and sense-making. 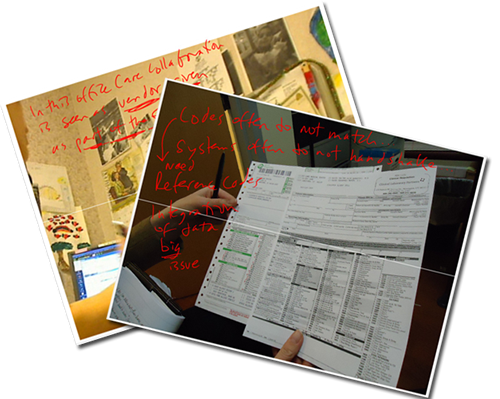 From the field studies, we discovered over-looked requirements and real user needs. For example, patient population management was not consistent and doctor's offices lacked good tools to manage and track sensitive patient populations. We were able to see disconnects with billing systems, EMR's (Electronic Medical Records) and current PCMH workflow tracking strategies. Capturing images of issues and 'artifacts' (items of workflow or emotional significance) helped the NaviNet team understand exactly what was happening in their user's environment. The end resulting value was that product management was able to target specific features and functionality as well as plan for how to better service their users.